You are here: Home / Forums / Main Poker Forum / Blogs / FEATURED BLOG: I see, I want, I grind, I get. I used to have another blog where I did the 100k hands challenge in 15 days (other blog, ‘its showtime CFP’), but going to make a new one here ;). My situation: Currently I am 20 years old, just finished high school this year and my plan was going to university and study fiscal economics. However, things have changed. I decided I don’t want to be that 9 to 5 working guy, getting a little above average salary and never enjoy life to the fullest. I love taking calculated risks, doing things that other will not be able to do. So I will start playing poker full time. Currently still living at my parents, but hopefully not too long anymore. I used to play a lot of checkers, which also involves a lot of focus and thought process. Played some European championship and like 6 Dutch championships, which is pretty cool. My poker story Started online around 1,5 year ago, made some deposit and of course just fucked it up. Lost it, redeposit, lost it again, had some break and then decided to take it a bit more serious. I started grinding nl2 zoom on stars, build up a roll to $500, cashed out and moved to other sites. Was splashing around a bit on NL10, making some profit, but nothing spectacular. Why I want to join CFP? Because I feel like CFP is not f*cking messing around. They got a game plan and from what I’ve seen, it works. I just want to take my game to a higher level and actually do this for a living and become the best that I can be. So it took some days before I could start playing. There was some issue and I decide to do some study. Studied NO BS 6Max again and did some Uhlvar Equity training. Really helpful. Anyway had some session with GG and other students, which made some things more clear. I have to say that I did not prepare too well, not having any questions etc. This will not happen next time ;). 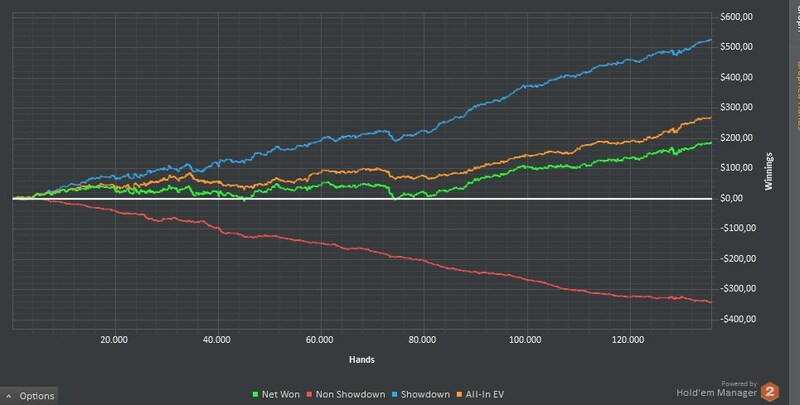 Anyway we had to play first 10k hands for review, using standard lines from NO BS. Didn’t play too much this weekend, but these standard lines are finally getting in my system. I don’t need to think about it anymore, basicly I know what to do instantly. Tomorrow I will try to play 10k hands as perfect as possible and upload the database again. In the past 4 days of playing I made 1 tilt-monkey-spew raise, but decide to quit right after. Also running a lot below EV, but this just happens. Anyway this is graph for now. Next week’s goal is to play 50k hands. Will switch to regular tables when I feel like I can play the standard lines perfectly. Tomorrow I will unlock some rakeback bonus. After i will switch to regular tables. Still running a lot below EV. Nice start! Love the title of the blog too! Sorry long time no update. I think the NO-BS strategy is getting more and more clear. Currently playing a mix of zoom and regular tables, just to get more hands in. 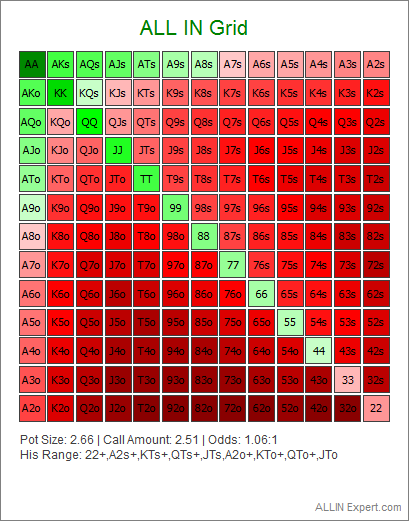 – Play 10k hands a day (70k total). – Study the NO-BS-6max book again. Getting closer to EV aswell. Pretty solid results playing NL2. This week will be moving up to NL5, might also change from pokerstars to ipoker, because of the rakeback + signup deal. I only managed to play about 50k hands, which is dissapointing. However, I got some solid profit. -Move up to NL5 and be a solid winner there. 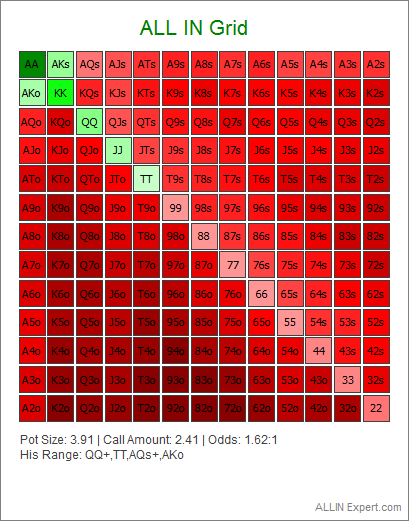 I did study the NO BS 6max again, but have only played 50k hands. I started out at NL5, but ran like 15 buyin below EV. At that point every stack I lost there made me frustrated, so I decided to move back to NL2. Still quite a bit below EV, especially since this is NL2+NL5. -Grind a sick amount of hands (100k is the goal). -I know some people say it’s bad to have monetary goals, but I want to make a 1k EUR month playing NL2. Have to put in sick volume, but atleast it will give me a healthy bankroll. Quick update: I moved to NL5 and will move to NL10 within a few days. There will also be some rakeback bonuses unlocked soon, but I already have the bankroll to play NL10. Feeling really good about my game at the moment, really crushing :). 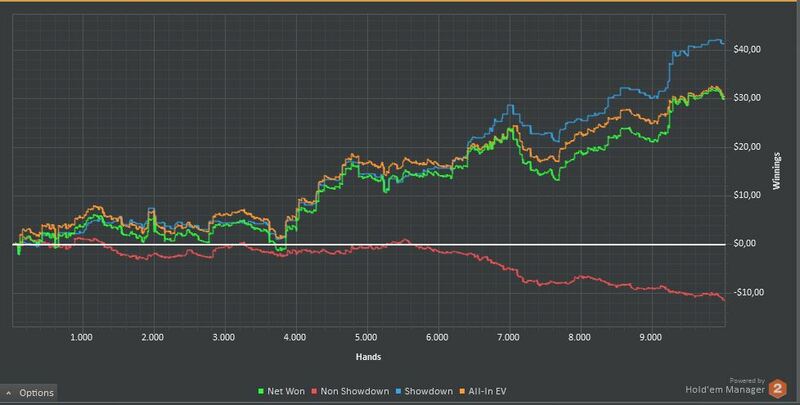 The problem in the beginning was that I was playing too much auto-pilot style, now I am trying to adjust to players and my winnings are going up a lot. Really enjoying grinding aswell. Anyway here is some graph update: Goals for this week have changed a bit, since I am not playing any zoom anymore. I will try to play 70k hands instead of 100k. I stick to 12-14 regular tables at a time. Only played 41k hands this week, but there is a reason for it. I moved to the intermediate course and there is SO much new information, I finally feel like I am really getting started. I will get used to the intermediate course, it might take some days and then move up to NL10 and obviously crush. This week will not be about a lot of volume nor profit, since I don’t know when I will finish the intermediate course. – Master the intermediate course. BB is only 63bb deep, SB vs BB I think a reasonable range for him is AQs+, TT+. Against this range I can stackoff with JJ, even with TT. We SQ preflop (shouldve been bit bigger) and we get jammed on by the initial 3bettor. I think his range here never contains something like JJ on NL2, it might be AK sometimes, but not everyone will stack off with this. That’s why I gave AKo/AKs, 50% likelyness. Looks like we can still stack off profitable with AKo in this spot. The guy was open shoving with A2o and QJs before. I assigned him the range of any pocket, any broadway, any Ax. Against this range my AJs is doing fine. We squeezed preflop and get jammed on. I think his range here contains 88+, AQs+, AQo+, since he is pretty short. Against this range we should NOT call with T9s, we can however call with J10s. I gave villain QQ+ AK+ 4b GII range and A2s-A5s 4b/fold. In this case it is profitable to jam with AKo. I gave him AA, KK (half as likely), AKo/AKs (half as likely) GII range against my jam and his 4b folding range I gave him A2s and A5s. Against this range we can stackoff with KK and even AKs. I gave villain a range of QQ+ AKo+, against this range this is a FOLD. What happens if we are only 100bb deep? In this case QQ becomes a call. AKo is super close, but it’s still a fold. Villain limp-raised, which is often very strong. I gave villain TT+ AKo+ range and against this range I should definitly fold. Villain was a fish, so I assign him the range of any broadway (suited and nonsuited), any pocket and any Ax. Against this range we have a huge range which can call profitable, even 89s. I gave villain a range of ATo+, ATs+, 55+, KQs+, KQo+. Against this range my AQo is doing fine.